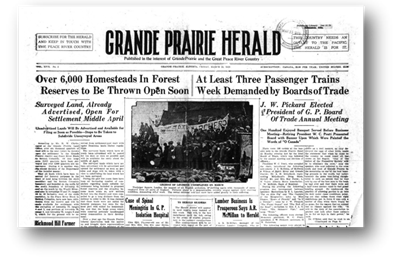 The Grande Prairie Daily Tribune got its start as the Grande Prairie Herald on 25 March 1913 by William C. Pratt, Publisher and editor. The newspaper eventually amalgamated with the Northern Tribune in 1939 to form the Herald-Tribune. It went through several name changes, owners, editors and amalgamations over the years until present day. Please see, Gloria M. Strathern's Alberta Newspapers, 1880-1982: An Historical Directory › for more newspaper titles in the Grande Prairie region. The Grande Prairie & District Branch, Research Committee will assist in filling your request. Our obituary index includes the Daily Herald Tribune from 1964 to present. For obituaries before or after these dates, please contact the Grande Prairie Branch. The library has a complete collection of newspapers for the district on microfilm. The service fee per obituary is $15.00. The cost includes a photocopy of the obituary, postage, plus title of the newspaper, date and page number. All payments should be in Canadian funds. We accept cash, personal cheques or money orders. Sorry, we are unable to accept credit cards or PayPal at this time. Our sincere gratitude to Laura Turnbull who originally started indexing the Grande Prairie Daily Herald Tribune. Since then, several members have contributed their time to the project.